As a quarterly our editorial is mostly about the previous quarter. Starting to come into its own. This neighbourhood originated in the early 1800s and was a home to many Irish emigrants from the County Cork. Across the street from me is the first Catholic parish built in Toronto in 1887 named St. Paul’s Basilica, and around the corner is the oldest church in Toronto, Little Trinity Church which was built in 1843. Since these early years this community has undergone many changes unfortunately not all for the better and with successive ‘Ward 28’ governments the whole lower east side of Toronto has been a dumping ground for the highly medicated or impoverished of Toronto. But things are hopefully changing. At the CRBA I am tasked with membership and communication. To this end I am using my passion to help improve and promote the area as a family community and get more neighbours involved with improving our streets and homes. 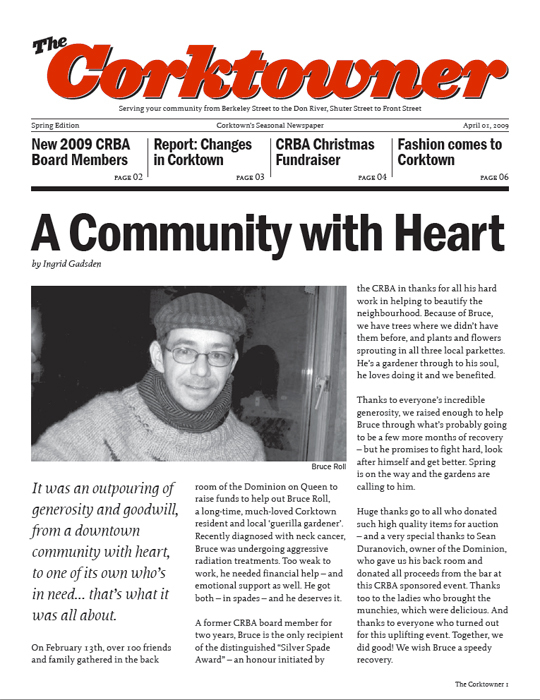 One of my specific responsibilities is the Corktown newsletter which I recently branded ‘The Corktowner’. The newsletter is basically an twelve page black and white document with a run of about 2500. 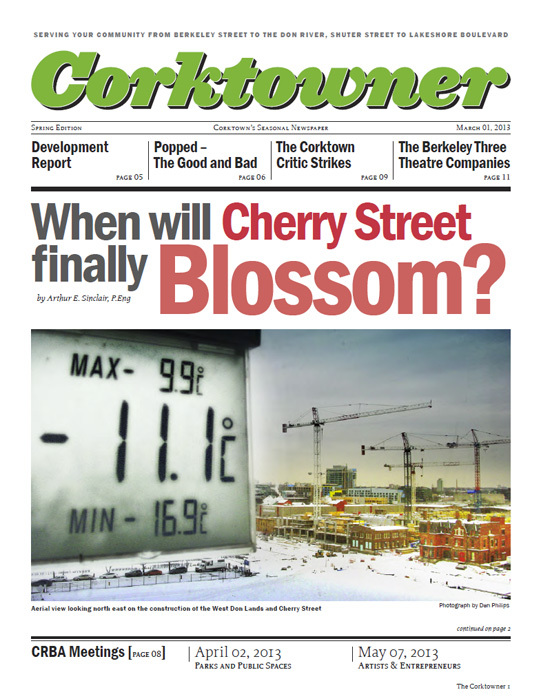 Besides from my skill set, my reasoning to tackle this twelve page quarterly publication was to bring some professionalism and consistency to the most read voice of Corktown. 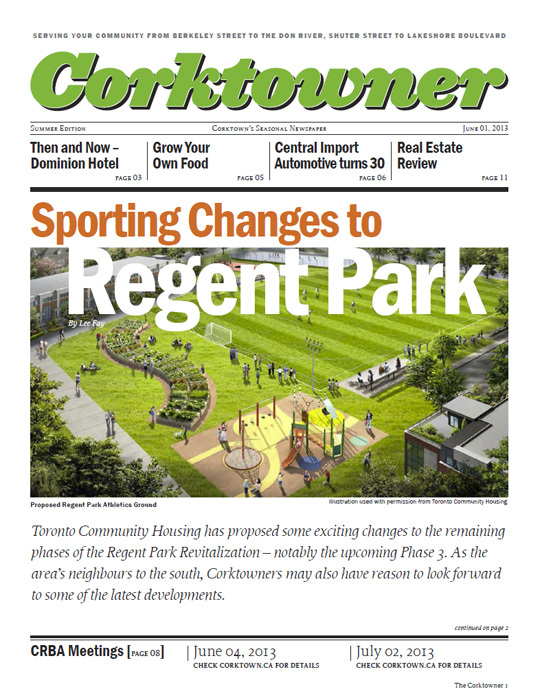 My thinking is simple; more people will get involved, advertise and promote Corktown if there is a sense of maturity and pride that emanates from its image. 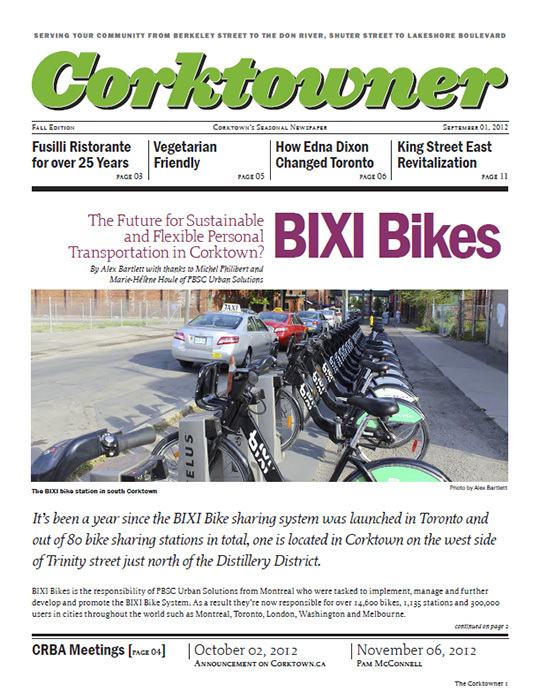 My aspirations are that this newsletter can act as one of the major catalysts to not just a Corktown revival but resurgence. I do enjoy this area and hope that my efforts will contribute a sense of pride and commitment that all my neighbours will act upon. This entry was posted on 2009.05.19 at 11.30 am and is filed under Independent. You can follow any responses to this entry through the RSS 2.0 feed. You can leave a response, or trackback from your own site.